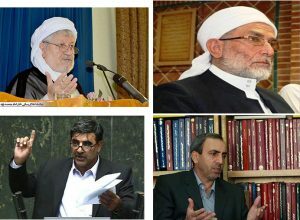 Iranian Sunni MPs and scholars in the Western province of Kermanshah denounced distortion of Shaikh Abdol-Hamid’s speech about the earthquake in Kermanshah and Iraqi Kurdistan. Mamousta Qaderi also criticized the MP Shahab Naderi on his insulting speech in the parliament about Shaikh Abdol-Hamid. Qaderi urged the remarks of Naderi do not express the views of Ulama and people of Paveh and Oraman region. Ali Kord, a Baluch MP in the parliament and Mamousta Mullah Ahmad Bahrami and Mamousta Loqman Amini from Javanroud and Kermanshah also denounced distortion of Shaikh Abdol-Hamid’s speech and insulting remarks of Shahab Naderi in the open session of the Majlis. Dr. Jalalizadeh and famous Kurd journalist Katayoun Mahmoudi also denounced the distortion and remarks of Shahab Naderi who issued a statement based on the distorted video. A group of Iranian Baloch writers and activists also decried the distortion of Mawlana Abdol-Hamid’s speech and called on the unity of Iranian nation.